Easter is an amazing opportunity to indulge your chocolate craving, but what if you're looking to diverge from the traditional eggs and bunnies while still staying festive? Easter is an amazing opportunity to indulge your chocolate craving, but what if you're looking to diverge from the traditional eggs and bunnies while still staying festive? Stick With Me Sweets brings color, unique flavor, and traditional pastry technique to each of its confections. Chef Susanna Yoon opened the quaint shop one year ago in New York's NoLita neighborhood. Fresh off her successful stints at Per Se, and Cafe Boulud, and her training at The International Culinary Institute, Chef was ready to be her own boss. 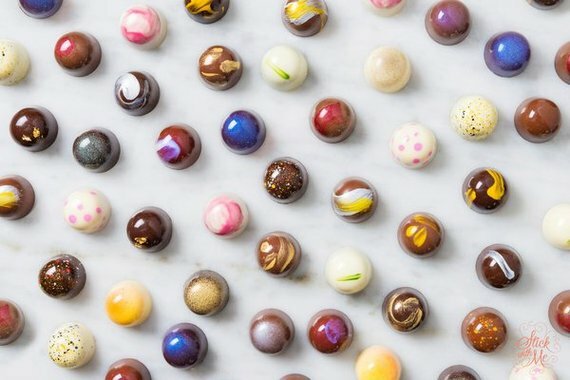 The shop takes a narrow space and makes it feel airy while showcasing the brand's many caramels, truffles, nuts, and--most notably--bonbons. Upon entering the storefront, you see a counter topped with an assortment of bonbons in perfectly-aligned rows. When requested, a server carefully picks each chocolate and places it inside a box that looks like a book. "Each chocolate has a story to tell," Chef says. Indeed, it is a fitting metaphor considering their bonbons are more than their covers. Gianduja Hazelnut: Filled with hazelnut ganache, it will melt on your tongue with the tiniest crunch. Raspberry Rose: The fruity and floral combination is like edible Spring. Black Sesame and Passion: The seeds are roasted to draw out their rich flavor, then topped with passion-fruit jam. 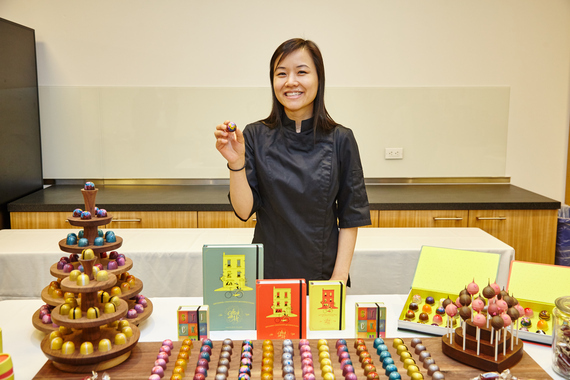 On January 27th, Chef Susanna Yoon was named one of the "Top 10 Chocolatiers in North America" by Dessert Professional Magazine. The event took place at the Institute of Culinary Education in NY's Financial District, and offered guests the opportunity to experience winning desserts from across the continent. Stick With Me Sweets more than held its own next to fellow winners, like Chocolat by Adam Turoni (Savannah, GA) and Polska European Bakery and Chocolat (San Luis Potosí, Mexico). My congratulations go out to Susanna, her team, and the rest of the winners. Susanna Yoon at Dessert Professional Event. Photo by Felicia Perretti. Space for a Natural Energy Drink?